The British Museum is the oldest museum in the world. The sheer number of artifacts is stunning. And they go back as far as you can go in human history, thousands and thousands of years. 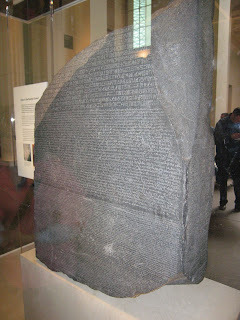 The first thing you encounter coming in one door of the museum is the Rosetta Stone. In my ignorance, I didn’t know it was a real thing. Here it is. Created in 196 BC, it’s got Greek and Egyptian versions of the same text, which allowed researchers to beging to translate hieroglyphics for the first time. Discovered in 1799, it took 20 years to translate it.